Astronomers obtained this portrait of Barnard’s Galaxy using the Wide Field Imager attached to the 2.2-metre MPG/ESO telescope at ESO’s La Silla Observatory in northern Chile. Also known as NGC 6822, this dwarf irregular galaxy is one of the Milky Way’s galactic neighbors. A stunning new image of one of the Milky Way's nearestgalactic neighbors, Barnard's Galaxy, reveals rich star formation andcuriously-shaped nebulas. At the relatively close distance of about 1.6 millionlight-years, Barnard's Galaxy is a member of the Local Group, an archipelago ofgalaxies that includes our home, theMilky Way. The galaxy, also known as NGC 6822, was discovered by theAmerican astronomer Edward Emerson Barnard in 1884. The new image, taken by one of the telescopes at theEuropean Southern Observatory in La Silla, Chile, shows Barnard's Galaxy beneatha sea of foreground stars in the direction of the constellation of Sagittarius(the Archer). Barnard's Galaxy is a dwarf galaxy that lacks the spiralarms of its neighbors, the Milky Way, Andromeda and the Triangulumgalaxies. 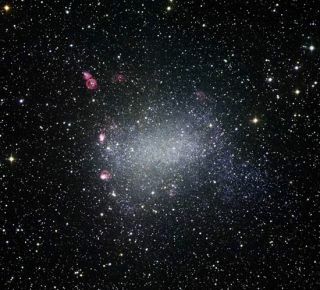 Barnard's Galaxy is also much smaller than some of its Local Group neighbors, with about 10million stars ? a far cry from the Milky Way's estimated 400 billion. Reddish nebulas in the new image reveal regions of activestar formation, where young, hot stars heat up nearby gas clouds. Prominent in the upper left of the image is a strikingbubble-shaped nebula. At the nebula's center, a clutch of massive, scorchingstars send waves of matter smashing into the surrounding interstellar material,generating a glowing structure that appears ring-like from our perspective.Other similar ripples of heated matter thrown out by feisty young stars aredotted across Barnard's Galaxy. Irregular dwarf galaxies like Barnard's Galaxy get theirrandom, blob-like forms from close encounters with or "digestion" byother galaxies. When twogalaxies collide, their gravitational interaction can warp the shapes ofthe galaxies.